If you want to know what inspires an entire nation, you’ll want to watch the video below that’s already gained more than 3 million views just hours after being posted. When given a $100 donation, a homeless man does something no one would expect – he uses it to purchase food for other homeless people. 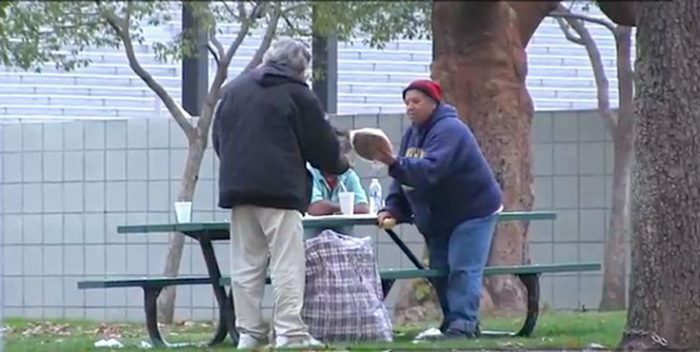 At first, it looks like the homeless man is going to blow the entire $100, given to him by a stranger on a street corner, on booze at a local liquor store, but Josh Paler Lin follows him with a hidden camera to see him walk straight to a local park and give some people sitting at a park bench – not alcohol – but food. He pulls Thomas aside and admits to him that he has been following him to see how he would spend the money, and eloquently Thomas explains that he became homeless through a serious of circumstances that couldn’t be helped – partially due to the withering away of funds due to sick family members. His mother died just weeks before he found himself on the streets and the condo she was living in was to be sold. In an outpouring of reciprocal support, Thomas has been given donations from all over the Internet, in part, due to Lin’s promotion of Thomas’ original, stupefying kindness. A fundraising page for Thomas that was set up with a $10K goal received double that amount in the first two hours of it being put up, and his since earned Thomas over $85K in support that could purchase back his mother’s condo if he decides to. It just goes to show that a small act of kindness can put you on a path to goodness that will overwhelm your greatest imagination. This mans actions are worth more than all the empty speeches and words of politicians. Also have to question the supposed legality of a law that forbids churches, or anyone for that matter for feeding or supporting the real human beings being disadvantaged.